Not the kind that tell us to cover the walls in mustard and begin referring to our dog as “Oh Great Kahuna.” Certainly not the kind that tell us to purchase an Audi. We hear YOUR voices. YOU’VE PROBABLY seen an E9X 328i at some point in your life. In fact, you’ve probably already seen one or two, or 20 (if you happen to live down the street from your local university’s sorority row), today. This particular BMW model is so prevelant, it may not even register when one happens to pull up next to you at a stoplight. BMW’s most popular 3-series was built as a stepping stone to the more powerful 335i and M3, right? Something for your wife or girlfriend to drive to her weekly facial appointment. No on in their right mind would bother buying such a platform with the intent to modify it, it’s pointless, right? FOR SOME professionals, the stresses of running a business revolve around which brand of coffee to stock in the employee break room, or whether or not they can make their Friday morning tee-off time. 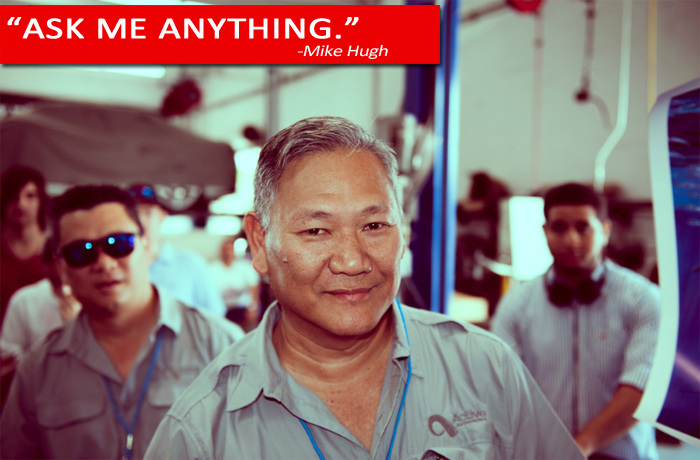 Fortunately for our customers, Mike Hugh would rather spend that Friday morning at the track, putting our latest products through their paces.